At first glance, Paeonia Top Brass doesn’t seem to be all that special. But be patient and give it a chance to bloom, because that’s when Top Brass will show its true colours. And as Cyndi Lauper would have said "Your true colours are beautiful like a rainbow". When the bud opens, a thick, yellow ball appears between the ivory white petals; and on top of that ball, a new, smaller sphere sprouts, light pink in colour. Top Brass is a double-flowered peony with double bomb-shaped blooms and long, firm branches. The petals are white with a pink touch on the outside. The relatively small buds bloom in a spectacular way. In that way Top Brass might be similar to Bridal Shower or Monsieur Jules Elie in a certain way. Paeonia Top Brass was registered in 1968 by Charles Klehm. It’s a seedling of Charley White which is a very popular variety in the United States. 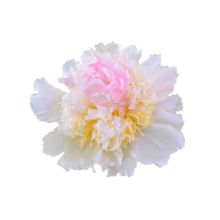 Top Brass is a special and exclusive peony that’s only available for a limited time. Make sure to order in time! Furthermore, once you obtained them, make sure to cut them diagonally before you put them on water.